Three months ago when my sister asked me to deliver a message to James Purefoy I barely know any of his works and really felt so out of place meeting him and not really knowing what to say. Anyway, I accomplished the mission which is found somewhere else in this blog and from the very limited information I can tell you, that mission has borne fruit. I am that good, what else can I say to you? Since then I have made an effort to watch Mr. Purefoy’s films and have enjoyed them, notably “A Dance to the Music of Time”. So you can imagine my surprise when my sister said that he will be a special guest for a limited time in “The Exonerated”, playing at the Riverside Studios in Hammersmith. I booked my ticket and will be watching him tonight, not alone this time but with my dear sister, who flew back to London after already being here just a month ago for this, yes just for this. “The Exonerated” shares the true stories of six innocent survivors of death row. Their stories, told in their words. Heart-breaking and uplifting verbatim theatre The Exonerated is a powerful take on the death penalty culled from interviews, letters, transcripts, case files and the public record. Written by Jessica Blank and Erik Jensen, “The Exonerated” played off-Broadway to sell-out audiences for two years, has toured across the US and received rapturous applause, standing ovations and further critical acclaim at last year’s Edinburgh Festival.This UK production of “The Exonerated” is timely. It highlights and brings closer to home what makes the death penalty a persistent topic of debate for the media, human rights activists and legislators. Today approximately 3,400 people are under the death sentence in the US, but since 1973 more than 115 people have been released from death rows throughout the States due to evidence of their wrongful convictions. In 2003 alone, 10 innocent defendants were released from death row. It wasnt my evening, but my dear sister’s. 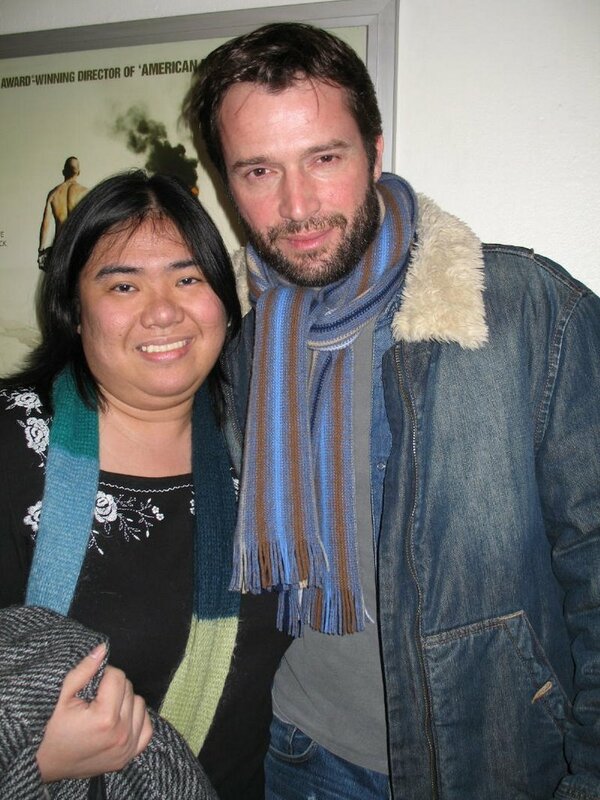 But Mr. Purefoy remembered who I was, the faithful emissary, and that’s why I earned this photo. He is a darling! It’s not really my place to say what else happened that night, apparently, “whatever happens in London, stays in London”. Great to meet the two of you. Wasn’t it fun? Thanks for the company and for making me do what you made me do! It was an excellent play and james gave a touching and sensitive performance as Kerry. holly!!! it was amazing. the play was amazing and powerful and gave me chills. james is amazing. it was a perfect night. we have to do it again! i still think of our happy dance as we turned the corner. i declare march 10 as the offical james purefoy day. do you concur? It´s amazing to find that Marc Anthony is such a friendly fellow out of Rome LOL. He was almost scary there! antony and cleopatra part deux! kingdoms are clay. love is immortal. Mrch 10 JP day…works for me. Wasn’t that a wonderful scarf he was wearing. I wonder who knitted it for him. Yes our happy dance. And what happened to the photo at the vegetarian restaurant sign?? No I reckon a fan knitted it for him…the next pressie maybe. I wrote my letter and told him i’ll be in Italy this summer. Teeehee. holly, you are mad about the boy! if they have tours of the cinecitta studios, maybe you’ll see him again! give him a kiss for me, will ya? Maybe the two of you may want to head over to Filmstalker (http://www.filmstalker.co.uk) and address the topic as to why James left V for Vendetta. yes, i agree, isn’t that a wonderful play? what an amazing performance from james. as for V for Vendetta, i heard that he didn’t like wearing the mask, that’s why.